Welcome back to another edition of Think Tank! When we hear the word combo, we generally tend to think strictly 'Card A + Card B + Card C = Jawsomeness.' Which is generally true - however, there is also another factor in combo deckbuilding strategy, and that is the element of cohesiveness - also known as synergy. What do I mean by synergy? Essentially, it is how well the individual cards in the deck mesh - or don't mesh - with each other. 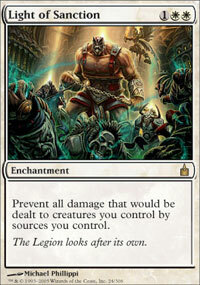 For example, Persecute and Megrim have positive synergy - the two combine to create a more powerful effect than either card could produce individually. Concentrate and Megrim have neutral synergy - neither immediately does anything particularly helpful to the other. (Cloudchaser Kestrel) and Megrim have negative synergy, since the former could potentially destroy the latter. The backbone of any good combo deck inevitably includes cards that are positively synergistic with the combo itself. This is a fact for several reasons - the main one being that often times you may not have the luxury of having every piece of your combo on the board. This disadvantage can be offset by having cards that are synergistic with combo pieces that are on the board. Synergistic cards give you something to do while you work towards activating your main combo - occasionally, they can even let you win the game without ever even needing to 'go off'. Now then, that out of the way, let's take a look at a deck that utilizes synergy. It's always fun to kill stuff. You just direct your finger to a smudgy monitor and proclaim your words of destruction to your opponent, who is probably sitting at his or her desk a couple thousand miles away. 'Wrath of God! Z00mg! R0kk0rZ!' Please, try to remember that some of us actually are somewhat close to 'normal' - if you're not sure what the word normal means, you should probably consult a practicing psychologist immediately. Of course, it's still fun to kill stuff either way. It's even more fun when you can do it in an incredibly one-sided manner. 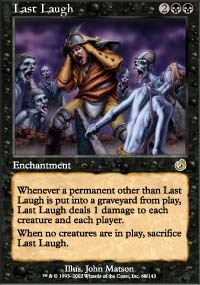 Last Laugh is a tricky card for several reasons. For one, once the board is empty, you have to sacrifice it, so it can hard to keep in play reliably. Second, the effect hits you as well as your opponent, so it isn't a free pass. This card is jank. Admit it. But if it keeps our critters in play, it's worth it. But this card isn't good enough to warrant admittance on its own, is it? It simply wouldn't do the deck justice to kill such nice critters without extorting a little something out of them in return, no? With Light of Sanction in play, even your stolen creatures are protected from Last Laugh. Now then, the main (and secondary) combo pieces revealed, how can we go about adding synergistic cards? Let's look at what the ultimate goal of the combo is. In this case, our objective is to deal damage using Last Laugh to every creature, thereby killing them all. Now then, what cards simply shrug off damage from Last Laugh? Anything with Protection from Black won't take a single point - and therefore will survive a hit in the event that Light of Sanction not be on the board. 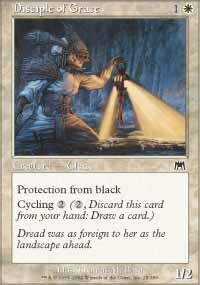 That in mind, the creature base should include several Pro-Black creatures. We still need more synergy. How do we go about trigger the combo? By killing something, of course. Hence, we need some form of reusable damage - which is rare in the colors we are in, black and white. My first instincts tell me to go with Pestilence - but of course, that card isn't even online (though its red timeshifted brother, Pyrohemia, soon will be). There is, however, Crossbow Infantry, which can actually serve a double purpose. It essentially scares your opponent into not attacking or blocking whatsoever, allowing you unfettered access to some juicy life totals. Aside from the Infantry, we can also turn to some dependable artifacts, where we find the fairly-costed Viridian Longbow. This can very well clear the board every single turn. 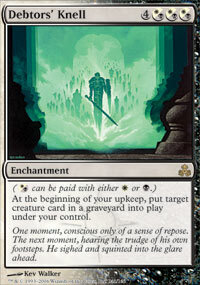 Both cards also play well with just Death Pits of Rath in play, as well, adding to our synergy count. Synopsis: This deck's strategy is to essentially pull out a one-sided, reusable Wrath by using Last Laugh, Light of Sanction, and Death Pits of Rath. Coupled with each other, these three cards create a monstrous killing machine. The Death Pits destroy every creature that is dealt damage, and Last Laugh provides a way for that damage to sweep the board. 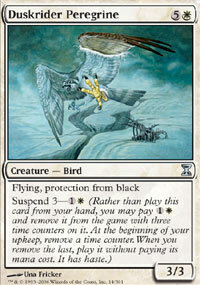 Light of Sanction prevents your own creatures from being hit, allowing them to hit your opponent unfettered. Since Last Laugh hits players as well as creatures, Urza's Armor can come in handy should you already be behind in the damage race. In addition, Debtors' Knell is particularly useful for stealing your opponent's creatures once they die from being Rath'd. The deck needs a way to continuously activate the combo, so Viridian Longbow and Crossbow Infantry serve as efficient, low-priced means to that end. In addition, certain cards in the deck allow you to go off without having every piece in play. Duskrider Peregrine, Disciple of Grace, and a lone copy of Akroma, Angel of Wrath (no pun intended) all have protection from black, allowing them to escape unscathed from Last Laugh if you don't have a Light of Sanction down yet. In addition, Viridian Longbow works well in conjunction with Death Pits of Rath, as it allows you to ping away at your opponent's horde. Both Diabolic Tutor and Dimir House Guard serve as spot tutors to fetch up pieces. Well, there you have it. Hopefully you've all learned a fair bit about synergy from this article. Until next time, good luck, and have fun! Im just worried about it being a little slow... I mean you got a combo that revolves around 4 - 7 mana cost drops... Im concerned about how well this could actually do against an aggro deck that runs a simple naturalize or disenchant like card. I would be a bit nervous about using Crossbow Infantry as a method of starting the chain. You might not have the protection, etc. 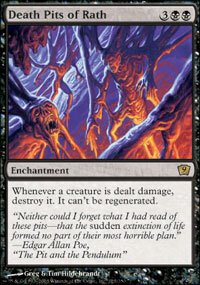 I would consider some form of non-creature damage. Rod of Ruin is one option. Vicious Hunger is another. Desert is fine, if you have them. For that matter, even something like Cruel Edict will start the chain - Last Laugh triggers off any permanent going to the graveyard. If you want an interesting way to start the chain, try Rancid Earth or Choking Sands. Sengir Autocrat is fine here - even one damage to him or a serf makes the damage increase rapidly. 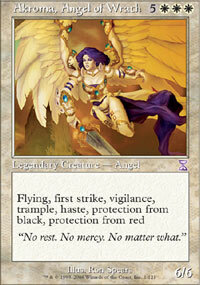 Sphere of Grace >> Urza's Armor, except for the $ cost. Nice approach. This whole idea is just fun. So many ideas. this deck seems, not to be mean, a little bit bad to me, I mean the combo is a bit to fragile to be effective... and I mean with the stuff you're using I'd imagine it'd just be cheaper and prolly more effective to just go another route with the deck.... It was a great article though. I actually tested this deck extensively, and I must say it performed very consistently, much more so than many decks I've made in the past. Remember that the deck can still function well without one or two of the pieces being on the board due to the synergy in the deck. I used your Come to Popa deck. Im having a blast with it. Thank you.